Echocardiography uses ultrasound waves to produce an image of the heart’s structure and function, to measure the blood pressure inside the heart, and to measure the direction and speed of blood flow. 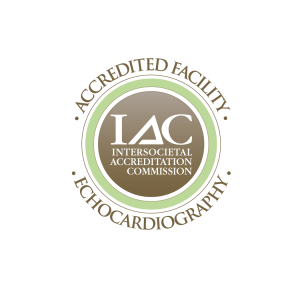 Standard echocardiography produces a two-dimensional image of a cross section, or slice, of the heart, its chambers and valves, and the large blood vessels of the heart. Doppler echocardiography bounces sound waves off the blood cells within the heart or blood vessels, and measures the speed and direction of flow. The test is painless, does not use radiation, and has few known risks. The function of the heart muscle, blood vessels, and valves. No known risks are associated with transthoracic echocardiography. 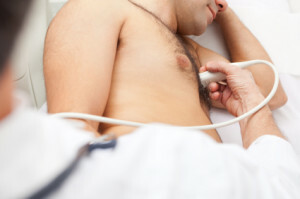 Echocardiography is performed by a trained sonographer. Throughout the test, an electrocardiogram, or ECG, which record’s the heart’s electrical activity, is performed to monitor the heartbeat and blood pressure is monitored. For transthoracic echocardiography, a gel is used on the chest to improve conduction and reception; it may feel cold and moist. For transthoracic echocardiography, the transducer is moved across the chest to gather data and the patient may feel slight pressure or vibration surrounding the area being examined. The patient may hear a “whooshing” sound, which is the amplified sound of the blood flowing. Occasionally, the patient may be asked remain silent or hold his or her breath so that the heart may be seen more clearly.